TestFX is an API for testing user interfaces written in JavaFX. It automates tests for JavaFX applications by simulating user interactions such as button clicks, typing text into a field, and many other interactions done in JavaFX applications. This article starts with a short background on the TestFX framework, so you can get an understanding of what it is based on and what its goals are. 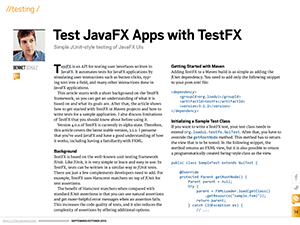 After that, the article shows how to get started with TestFX in Maven projects and how to write tests for a simple application. I also discuss limitations of TestFX that you should know about before using it. Akzeptanztests – Geliefert wie bestellt!